2702 is a 0.13mm premium quality, electrical self-extinguishing soft PVC tape that uses an aggressive pressure sensitive rubber-based adhesive system. It has been designed for use where a recognised specification or international standard is required and where environmental safety is a concern. Rolls should be stored flat on their cut edges in the original packaging. The product must be protected from dust, heat, moisture, direct sunlight and solvent fumes. The storage temperature should be between +10°c and +25°c. Use within 24 months of receipt. 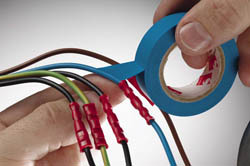 The tape should be applied with sufficient tension to ensure an optimum bonding and a minimum of two layers with a half overlap. The final layer should be wrapped with a lower tension to prevent flagging effects.